Envira Gallery has come a LONG way since our launch! …and much more (over two dozen addons). Since the beginning, we’ve offered an Ultimate license which comes with lifetime access to support and all future updates, for a one-time fee. However to more accurately reflect the value users get from Envira Gallery and to make room for us to focus on other amazing features coming your way, we’ll be removing our Ultimate Lifetime plan effective October 16, 2017. You can click here to invest in lifetime updates and support while it lasts. If you already have a license, then you can upgrade to the Ultimate license by logging into your Account Area and clicking on the Upgrade link. Please note that if you already have an Ultimate license, then this will not affect you at all. Existing Ultimate license users will continue to have access to all future updates and support for life (exactly as we promised). For those who DON’T have an Ultimate license, we appreciate your support and wanted to give you an opportunity to lock-in lifetime updates before this plan goes away forever. Ready to unlock lifetime updates? To lock in your access to ALL features and addons for life plus lifetime support for a one-time fee, click here to get an Ultimate license before October 16th. As always, thank you for your support! 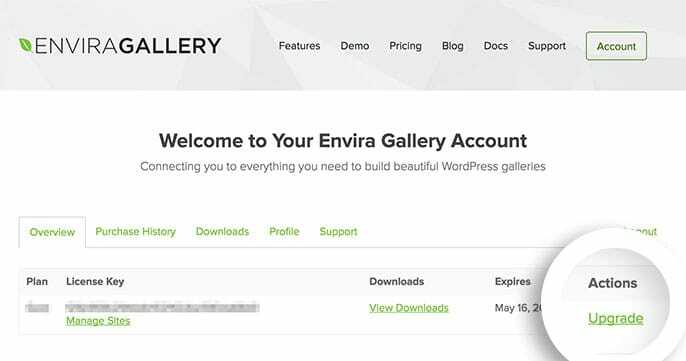 Your feedback, comments, shares, and messages are crucial to help us make Envira Gallery the best gallery plugin for WordPress. We have some amazing new features on the way, so be sure to stay in touch. To be the first to know, subscribe to our email newsletter and follow us on Twitter and Facebook. Big Envira Updates Coming This Week - Including Albums! Please Read! Hey David, I think there’s a misunderstanding here. We’re not discontinuing the Envira Gallery Lite version on WordPress.org. If you’re using the free version, nothing will change – you’ll still be able to get updates. This change only affects the Ultimate license version. For a while, we’ve offered a license option where you can opt to pay a one-time fee and get lifetime support and all addons and updates for life. That’s the only thing that’s changing – we’ll no longer be offering the Ultimate license.